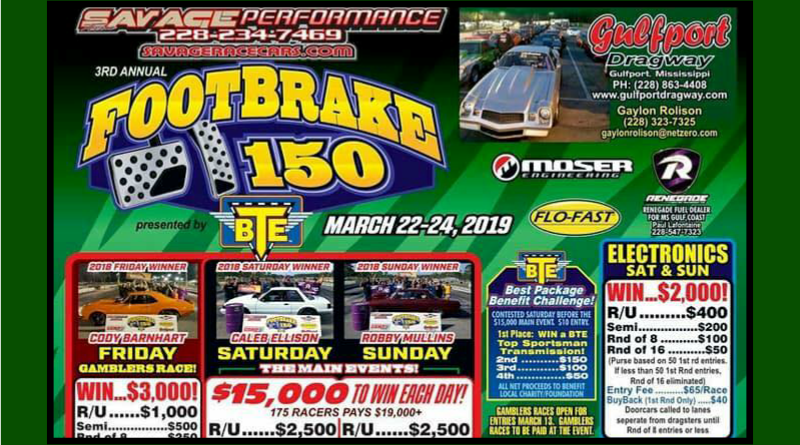 Gaylon Rolison and Gulfport Dragway present the 3rd Annual Savage Performance Footbrake 150 presented by BTE. The big money footbrake bracket race will pay $15,000 to the footbrake winner on Saturday and Sunday. The event includes something for everyone with Gambler’s races, shootouts, electronics classes, and more. The No Guts No Glory Gambler’s race seems the most intriguing as a 16-car field will battle for the $8,000 payout. The racers will determine how the purse will be divided. Previous winners of the event include some of the top names in footbrake racing including Cody Barnhart, Lucas Walker, Caleb Ellison, and Robby Mullins. Each of whom have added their name to the Footbrake 150 Hall of Champions list. For more information, see the event flyer posted below. DragChamp is your source for big money bracket racing news and results.